Hello! I�m Mary Lavan but my friends just call me Mare. 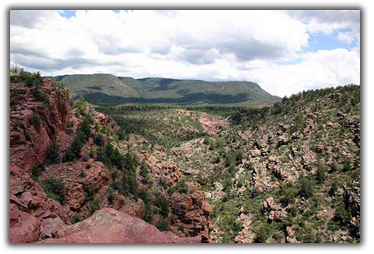 I am a studio potter living and creating in the beautiful mountain hamlet of Pine, Arizona located along the Mogollon Rim. I use a variety of wheel throwing and hand building techniques to create my decorative and functional pottery. Most of my work is cone 6 oxidation fired stoneware; however, I�m looking forward to experimenting with other clay bodies and firing methods in the near future. Of course I only use non-toxic lead free glazes. My functional ware is also dishwasher and microwave safe with a few noted exceptions. Living in the midst of the largest stand of Ponderosa pines in the world; I can�t help but be influenced by my surroundings. You will often see natural elements from my backyard incorporated into my work. The twig handles on my mugs are my way of contributing to our local fire fuels reduction program. Just Mare Pottery launched in October 2007 on Etsy; an online marketplace for handcrafted items. This venue allows me to reach an international audience from my little studio in the forest. You can visit my | Etsy Shop | or by clicking on the Shop link above. 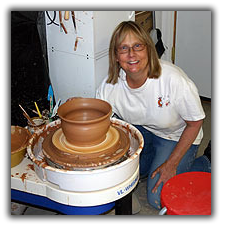 I am a proud and humble member of the Potters Council of The American Ceramic Society, and the Etsy Mud Team.